Most people think they know what formats iPad supports, but they understand only part of the story. You know iPad supports .mp4 file format. Yet what you probably don't know is that not all the varieties of .mp4 format are supported by iPad. iPad only supports .mp4 file format encoded by H264, MPEG-4 or Motion JPEG (M-JPEG). As for the .mp4 file encoded by other codecs like AVC, MPEG-2, your iPad doesn't accept them and that's why MP4 can't transfer to iPad. On top of MP4 codecs, another point you need to pay attention to is that iPad also has its standard limits on .mp4 video parameter settings. If your .mp4 (H264) file features 60 frames per second, there stands a big chance that you fail to play MP4 video on iPad normally due to the non-standard parameters. In addition, suppose that you open Safari to play online MP4 but this HTML5 video isn't playing on iPad, no need to look around, HTML5 player is the chief culprit. MacX Video Converter Pro: Give You the Required! 1. No.1 fast speed and losslessly convert MP4 from AVC, H263, MPEG-2, etc. codecs to iPad supported H264, MPEG-4 or Motion JPEG codecs in .mp4 file extension to solve MP4 can't transfer to iPad problem. 2. Convert MP4 to iPad H264 or MPEG-4 with best default parameter settings. Of course, you can also manually adjust parameters incl., resolution, frame rate, etc. 3. Download MP4 video from YouTube, FB, Vimeo, Myspace, etc. 300+ sites to iPad. No need to look for the specific solutions to the three problems you meet. With this cover-all solution MacX Video Converter Pro, you can easily tackle them all without any third party software. Convert MP4 video from AVC, AVCP, dvav, hev1, mjp2, etc. to iPad supported H264, MPEG-4, Motion JPEG codecs in .mp4 file extension. 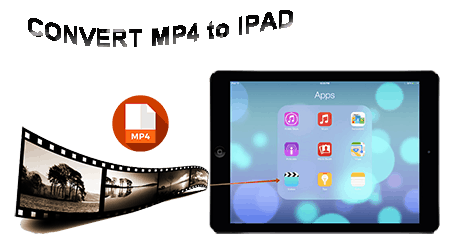 Thus, you can successfully transfer MP4 videos to iPad without MP4 codecs incompatibility issues. BTW, it also enables you to convert MP4 to iPhone, MKV to MP4, MP4 to MP3, etc. 180+ video, 14+ audio formats and 350+ latest mobile profiles. Convert MP4 to iPad with best iPad parameter settings: H.264 codec up to 2160p, 30fps, audio bit rate up to 160 Kbps, 48kHz and MPEG-4 codec, up to 640X480 pixels, 30 fps, AAC-LC audio up to 160 Kbps, 48kHz. Of course, you can free adjust MP4 parameters incl. resolution, frame rate, etc. Free download online MP4 video movie in 720p, 1080p or 4K 2160p from YouTube, Facebook, Dailymotion, Vevo, Myspace, etc. 300+ sites to iPad Pro, iPad Air/Mini series for offline watching without HTML5 player. Hence, Safari MP4 won't play on iPad problem is easily resolved. The following parts will walk you through the whole MP4 to iPad conversion, MP4 parameter adjustment and MP4 video downloading process. Prior to embark on the detailed steps, you need to Free download MacX Video Converter Pro on macOS (or Windows version). Then run it to go on. Step 1: Import MP4 files into this Mac video converter via "Add Video" button at the top banner of the main interface. Or just drag and drop MP4 files to this app. Step 2: Move mouse to click "Apple Device" profile and select "to iPad Video" > "iPad Pro (H264)" or "iPad Pro (MEPG-4)" as output video format. Step 3: Tap "Browse" to select the destination folder for output MP4 storage. Step 4: Click "RUN" and this program's conversion engine will go into action to start converting MP4 to iPad MP4 with H264 or MPEG-4 codec. Step 5: Import MP4 to iTunes after the conversion is over. Then use iTunes or apply MacX MediaTrans to transfer MP4 videos to iPad. Step 1: Add MP4 video to this MP4 video converter, same to the above Step 1. 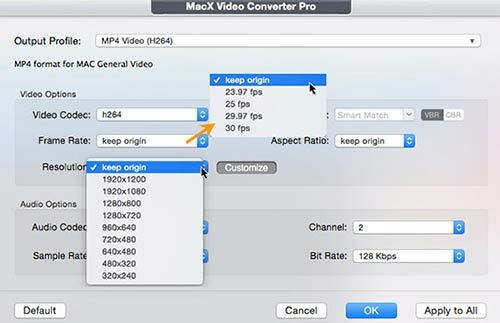 Step 2: Choose "MP4 Video (H264)" or "MP4 Video (MPEG-4) from "Mac General Video". Or just choose "to iPad Video" based on your option on the pop-up window. Step 3: Click "Settings" icon on the main interface. Step 4: Change iPad MP4 video resolution: up to 3840x2160 pixels for H264; 640x480 pixels for MPEG-4. iPad MP4 video frame rate: up to 30 fps for both H264 and MPEG-4. AAC-LC audio: up to 160 Kbps, 48kHz. More iPad Pro specs from official site. Step 5: Tap "OK" and hit "RUN" to apply all changes to MP4 video. After it's finished, add MP4 to iPad to see if MP4 can normally play on iPad. Step 1: Copy the MP4 video URL you wanna download and then paste the URL to the analysis bar. Afterwards, tap "analyze" to load the MP4 YouTube video details. Step 2: Choose video format, resolution, codec and file size according to your specific needs. Step 3: Hit "Download Now" button to begin downloading MP4 video from YouTube, Dailymotion, Myspace, FB, etc. to iPad Pro, iPad Mini 4, iPad Air 2 and more iPads. Note: no need to worry about the video downloading speed, for this video converter supports Intel Quick Sync Video hardware acceleration tech to improve downloading speed up to 5X faster than any other downloaders. MacX Video Converter Pro, whose power ability enables you to convert MP4 to iPad MP4, MOV formats with H264/MPEG-4/M-JPEG, AAC codecs, adjust MP4 parameter settings (resolution, frame rate, bit rate, etc.) and download online MP4 video movie for watching without HTML5 player.